Thinking, making and doing new things can happen at any time. It just takes a change in perspective. 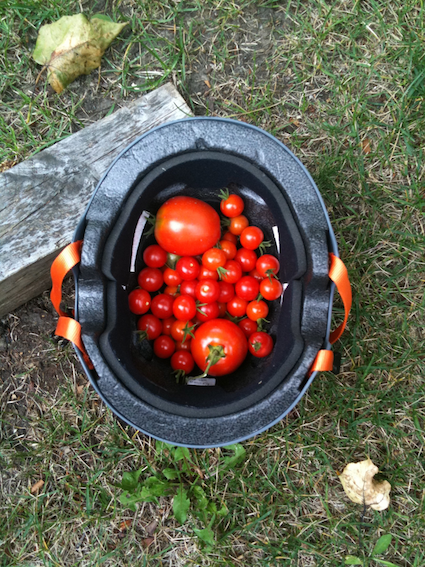 As I was heading back out to the lake yesterday from my home in the city, I had to stop in pick up bicycle helmets from the garage and harvest my garden’s tomatoes. The door to the house was locked so I didn’t have a bag or bowl for the tomatoes. I was stopping at the garage on my way to the garden and I picked up my son’s helmet first. As it hung upside down on his handle bar, I could see the perfect bowl. So I went to the garden to harvest my tomatoes and put the helmet and tomatoes in the back of my car. Believe it or not, this is an example of what makes a city tick. Our economic life – our ability to generate new work – is the force that generates cities. The development of new work is fundamentally our ability to think, make and do new things. At heart is the ability to take something, say a bicycle helmet, and use it for a new purpose. Like flipping a helmet upside down to carry tomatoes instead of strapping it around a human head. One of Jane Jacobs’ main ideas is that all new work takes place on the shoulders of existing work. New ways of thinking, making and doing new things always use existing work. Just like using a helmet to carry tomatoes. To grow cities that serve citizens well, we need to draw on the innovation that cities generate. To do this, we need to grow citizens that serve cities well. This requires a citizen practice where we remain open and curious to possibilities and potential. We need to be forever looking for ways to make use of our helmets. Join me and 50 visionaries to re-envision the future of city at the City 2.0 EXPO, September 4-27, 2012. We are gathering leaders and city-zens the world over for an unprecedented – and free – virtual conference. Join us to dream the future of the city.